Epiphany in Sorrento and Amalfi Coast. To conclude the Christmas holidays, in Sorrento will take place some events. 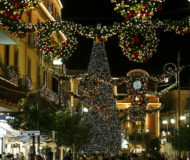 Description: To conclude the Christmas holidays, in Sorrento will take place some events.